Erected by Robert Cormack West Clyth in memory of his beloved wife. Janet Sutherland died 28th November 1870 aged 58. Son John died 10th April 1840 aged 4. Son Don died 18th February 1845 aged 7. Daughter Janet died 1848 in infancy. 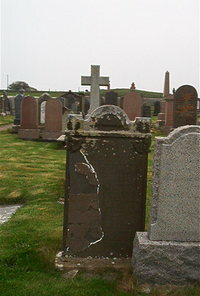 Daughter Margaret Cormack died 14th March 1873 aged 22. Son Robert Cormack died 18th August 1877 aged 33. Son John Mackay Cormack drowned at sea in sight of where this stone stands 8th August 1883 aged 34. Husband Robert Cormack died 15th May 1885 aged 75.